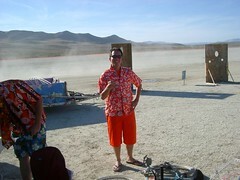 I caught a brutal cold on my return from Black Rock City, so I haven’t been much in the blogging mood. But I’m starting to feel better (or the glass of Sake is really working its magic) and thought I’d post a quick blurb about the trip. For those of you who have never heard of Burning Man, the wikipedia has a pretty decent entry on it. For more information, I would also recommend checking out the Burning Man website. For an über geek perspective, check out Chris Sell’s writeup. To me, Burning Man is a temporary community that comes closer than any other community I have been apart of to embodying inclusion. 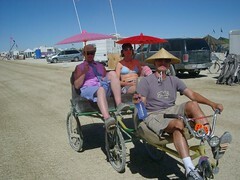 Radical Inclusion is one of the ten guiding principles of Burning Man. It may sound somewhat utopian, but it works pretty well in the small scale. First, before I forget as I tend to do, let me post a link to my photos from Burning Man hosted on Flickr. Just seeing for yourself is another great way to learn about it. The thing that most impressed me about Burning Man my first time was the sheer amount of creativity that seemed to explode across the desert. Again, this year I was not disappointed. What set my second time apart is that I knew more what to expect. Thus I was more prepared to be involved in the festivities. Burning Man blurs the line between participant and audience. There isn’t a sense of “Oh THEY are performers and we are the audience.” Oh no no. Everyone is a mix of both. 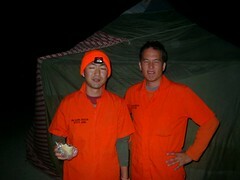 To that end I enjoyed diving into the scene with a costume here and there such as this Black Rock City Jail jumpsuit. It was perfect for the Orange party, with its squadron of orange nazis who only allowed those fully in orange to enter. For our annual luau, I made sure to bring my aloha shirt. Somehow I had inadverdently made orange a bit of a theme for me this year. I would have taken even more photos but my camera choked on some playa dust and stopped working. That sucked. I won’t go into much detail about Burning Man this year, but I will mention that one of the more memorable highlights were seeing such big name DJs as Paul Oakenfold and Tiësto perform. True to Burning Man spirit, they performed for free and paid their own way to the event. Tiësto even made a donation to the hosting camp as they were in depth from all their efforts to put on such a good show. You have to realize these guys regularly command somewhere in the $30K to $40K range for a two hour set at a normal club. Among other highlights was the fact that this was my buddy Kyle’s first time. I’m pretty sure he had a good time. It is late and I leave you with a pic of the trike that our buddy Dane built. That’s me in the front pedalling these lazy fools around.